Disculpa, esta página aún no está disponible en tu idioma. Por favor, elige uno de los idiomas que ya están en línea. There has been constant demand among pilots for this SWING success since it was introduced. Nevertheless we are often asked when there will be a replacement for the ARCUS. Our reply: when we have something better! The ARCUS was developed over several years since there was no pressure on SWING at this time to bring out a beginner glider. This means that the glider was continually optimised over a very long period of time by intensive test flights. For more information click here. The ARCUS is still one of the highest performing and safest wings in its class, as it always was, which proves that the concept was years ahead of its time. The ARCUS will therefore still be included in our 2002 current product range. The concentrated work to develop a successor will of course be pursued intensively - but there will not be a quick solution. 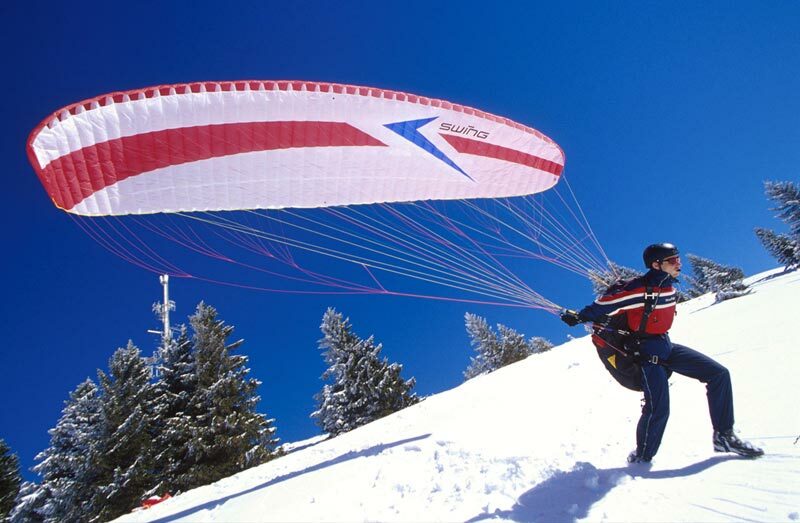 Enthusiasts for this paraglider range from the beginner to the pro and from pilots of both solo and tandem wings and paramotors. Performance has never been so simple and safe to achieve! Designed as a pure Intermediate (with 46 cells and an aspect ratio of 5) the ARCUS makes a mark with all the technical features of the current SWING models: diagonal tape construction, load-bearing tape on the D-risers, split A-risers, stabiliser breaks etc. The materials used have proved themselves over many years. We are so confident about this combination of materials that we give a 3 year (or 300 flight hours) warranty for the complete package, in particular the fabric. The high prices for second-hand SWING gliders are not least a result of the fact that they hold their value. The fascination for free flying reaches its current peak in the Swing ARCUS. Simplest launch behaviour, forgiving handling, a high safety margin and performance potential beyond its class come together in the ARCUS in a sensational combination. You set the limits!